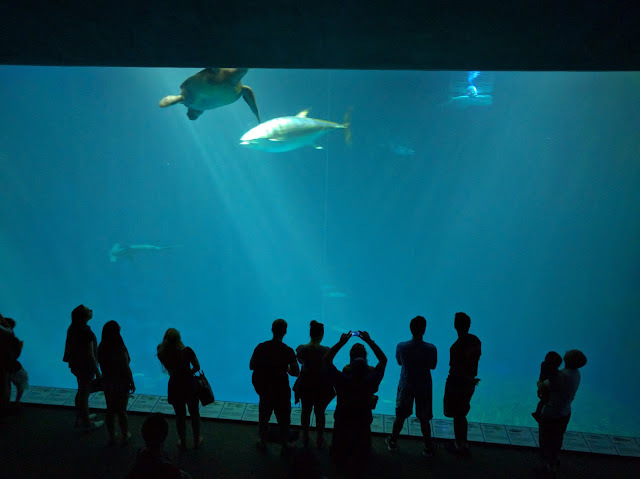 The Monterey Bay Aquarium, located in Monterey, California, is a stunning aquarium located on the former site of a sardine cannery on Cannery Row that opened to visitors back in 1984 showcasing the habitats and sea life of one of the world’s richest marine regions. The Aquarium is home to more than 30,000 creatures that represent over 550 species with over a hundred exhibiits. It truly is a window to the wonders of the ocean and how we can help conserve marine life through sustainable fishing and protecting the oceans. The goal of the non-profit public aquarium is to inspire ocean conservation through its exhibits, education, research and conservation programs and provide its 2 million annual visitors a glimpse into their plan. The Monterey Bay Aquarium website has some great information about all of the exhibits showcased at the aquarium, as well as a nice Visitor's Guide that you should familiarize yourself with before your trip. 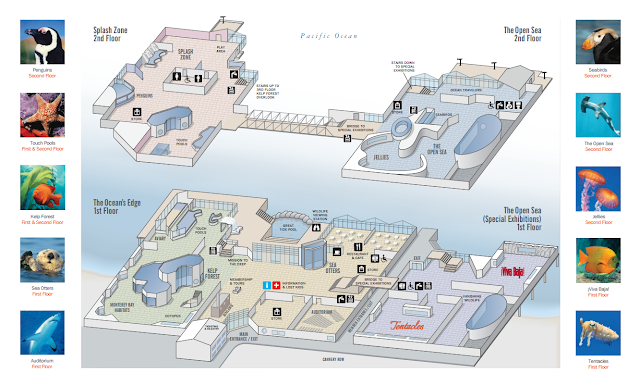 I always like reviewing the layout of the exhibits and having a plan of how we'll be going through the attractions. From the entrance into the main hallway, go left towards "The Ocean's Edge" exhibit. Immedietely head upstairs to check out the Kelp Forest and Splash Zone. After seeing all of the exhibits on the second floor, head back downstairs to see the first floor exhibits, including the Kelp Forest, Monterey Bay Exhibits, Aviary and Touch Pools. From here, head outside for some nice scenery and views of the tide pools and Monterey Bay. Head back inside towards the Sea Otters exhibit and if there is a feeding going on, stop to check it out. Before heading towards the other side of the aquarium, stop for snacks, lunch or a quick break near the cafe and gift shop area. After seeing these exhibits, head downstairs to the Viva Baja and Tentacles exhibits. It is easy to miss this set of stairs (or the elevator) to these exhibits on the lower floor, so keep a look out for it. General Public: 10 a.m.–5 p.m. Parking will cost you approximately $10-$15 depending on which option you select. The Golden 1 credit union offers its members discounts on a variety of attractions, including the Monterey Bay Aquarium. Discounts are around $10 per ticket from the listed prices. Based on our previous visits here, I would highly recommend visiting the aquarium if you haven't ever been here. 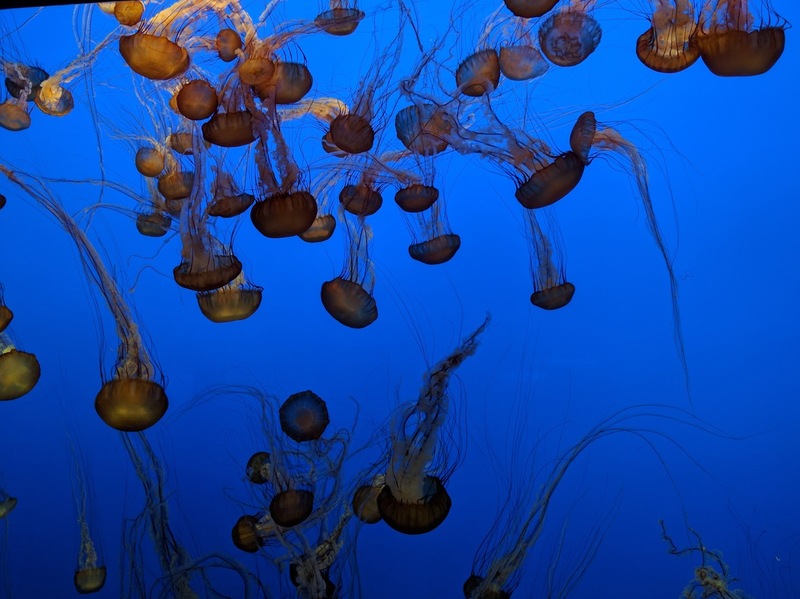 Another popular aquarium we've recently visited is the Aquarium of the Pacific in Long Beach, CA. I would say it is on-par with the Monterey Bay Aquarium in terms of exhibits, though the Monterey Bay Aquarium is a little bit larger and my preference if I had to pick between the two.